Having orthopedic surgery is a positive step on the road to recovery after illness or injury, but the process of recuperation and rehabilitation can be arduous and taxing. Some days, progress may be hard to notice, and there will be days when finding that motivation to go to physical therapy or to move around will take every bit of oomph you have in your being. After all, with the pain, potential side effects of medication, and lack of mobility, it can hard to focus on long-term goals. And with the number of orthopedic surgeries projected to reach 6.6 million by 2020, chances are fairly high that in the near future, you or someone you love may be recommended to undergo an orthopedic procedure. Staying motivated is vital for a swift and successful recovery. In fact, some studies credited motivation as the most important factor in determining the length of one’s recovery time from an orthopedic procedure. So how does one stay motivated after orthopedic surgery? After all, with patients fighting off depression, anxiety, pain, stress, and irritability during this difficult time, staying positive may be easier said than done. Here are some tips and tricks to help you stay motivated after orthopedic surgery to make sure you stay on the path to a smooth recovery. While a certain amount of bed rest is necessary for healing, you should gradually be increasing your activity each day post-op. 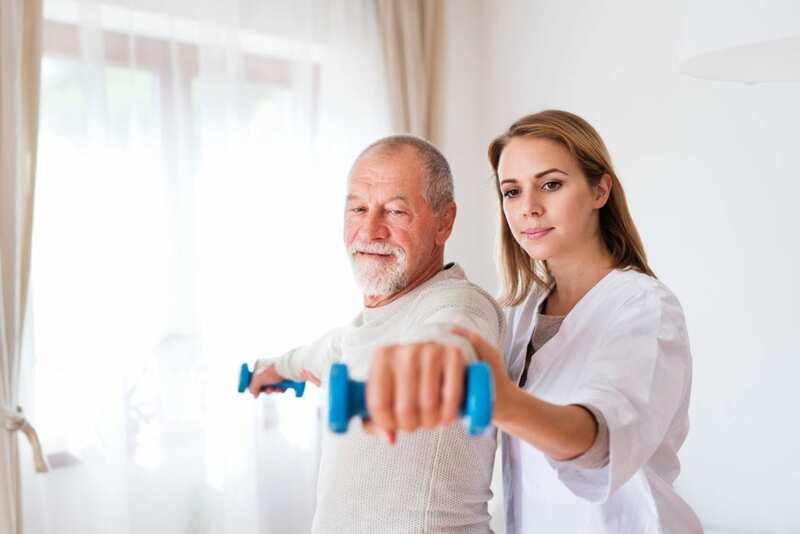 Physical therapy will play an enormous role in this, as your physical therapist will introduce and outline a series of exercises to increase mobility and range of motion. Be sure to select a therapist who meshes with your personality and schedule, and provides an essential dose of positivity. Look to your time at PT as “me time” by making it a point to enjoy the therapeutic part of the treatment, which may include deep massage or heat and TENS therapy treatment. Take careful note of what your therapist says, then follow through. Seek out small victories every day, and be sure to ask your therapist to let you know how she is gauging your progress. Consider keeping a journal of your progress by noting steps taken, weights lifted, and exercises learned. It doesn’t hurt to also write about your journey; you may notice certain trends such as days of the week when you feel better, or times of the day you hurt more. Social-media minded patients may want to track their progress via online blogs, Instagram, Facebook or snapchat. This process can be very cathartic, and you may consider sharing it with your physical therapist. Don’t go it alone. Recovery can be an isolating and sometimes lonely time, as you may not be participating in regularly scheduled activities or attending work or social events. Accept the help and social support of friends and family, even if it’s for small tasks such as bringing you the mail, driving your kids or making a trip to the market. Confiding in a fellow PT patient is another great way to stay inspired. Being out of your normal routine can make things seem chaotic. Set time each day to carry out routine tasks – whether showering, reading the newspaper, completing PT exercises, or having visitors. It will give you a schedule to adhere to, and make things feel a bit more strategic. There are many ways to prep yourself and your environment before surgery so that staying on track is easier. Taking time to complete any outstanding chores, work, or hobbies that need to be finished prior to surgery will free up more time to heal. Prepare meals ahead of time, pay bills, record your favorite TV shows or download your podcasts. Don’t forget to reorganize your home so that items you’ll need are easy to find and close at hand; one example would be setting up a computer station next to your bed or clearing space between rooms to accommodate a walker or crutches. You’ll also want to schedule time for any beauty appointments or haircuts prior to your procedure – especially pedicures if you are expecting to wear a boot or cast; we all know when you look your best, you feel your best. Selecting a team of venerated professionals that you can rely on plays an important role in your recovery. The board-certified surgeons and licensed physical therapists at Orthopaedic Associates of Central Maryland offer personalized treatment plans that cater to your unique requirements. Their on-site state-of-the-art physical therapy facilities and compassionate, patient-focused care will provide you much-needed peace of mind. For more information, or to schedule an appointment with Orthopaedic Associates of Central Maryland, call 410-644-1880, or toll-free 844-215-5993.